Invented in 1913 by William D. Coolidge, the Coolidge tube is by far the most popular method used to generate x-rays. Essentially it’s just a thermionic diode, but one optimized for high voltages and high powers. 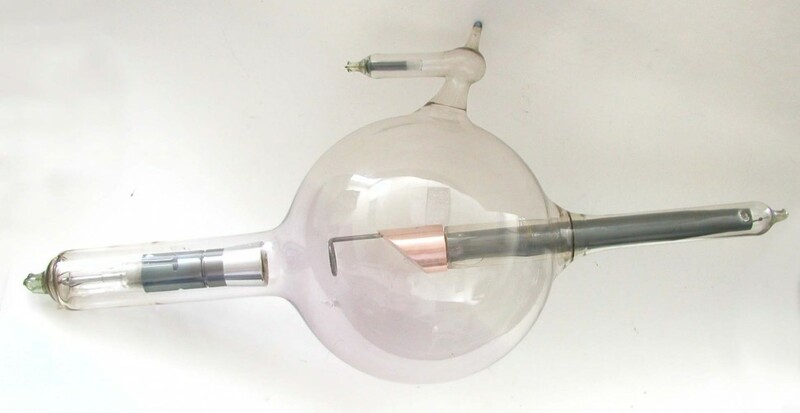 Like a thermionic diode a Coolidge tube is a vacuum tube evacuated to the lowest pressure reasonable, and also like a thermionic diode it has a heated cathode and a (theoretically) cold anode. The Coolidge tube’s method of operation is rather trivial. The heater is given a little bit of current to warm it to incandescence, and the hot tungsten cathode then ‘boils off’ electrons. These electrons being negatively charged, are attracted to the positively charged anode and proceed to move towards it. When the electrons slam into the anode they lose energy. 99% of the impacting electrons end up grazing atoms and they stop slowly, at the same time dumping their energy in small potions as heat (infrared photons). Some electrons however, maybe 5%, generate x-rays in a process called bremsstrahlung, aka braking radiation. This small portion of the impacting electrons comes very close to the anode’s atoms and slingshots around the nucleus, dumping most of its energy at once. These electrons were moving very fast, and their huge abundance of energy is all released in one, or a few photons. X-ray photons. These x-rays then exit the glass envelope. What determines the energy of the x-rays produced is the amount of voltage present on the anode. It’s quite simple actually, more voltage means more attraction, and more attraction means the electrons impact faster. Faster electrons means they slingshot around atoms with more force, and thus “harder” (higher energy) x-rays are produced. Bremsstrahlung is a continuous spectrum of radiation, akin to a “white light” source. Since most x-ray producing electrons graze some atoms before slingshotting they tend to lose some energy before they make any x-radiation, and thus a whole range of energies are produced. 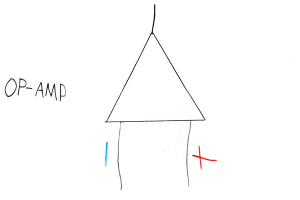 The maximum energy that the x-rays can have is limited to the voltage applied on the anode (kilovolts peak, or kVp), but most of the x-rays produced by bremsstrahlung are low energy x-rays. Since the lower energy x-rays are not able to escape the tube’s glass envelope the bremsstrahlung spectrum of a glass Coolidge tube actually looks like this; most of the soft x-rays are blocked. To combat this issue some x-ray tubes have a beryllium window that lets the soft rays through. Beryllium windows are expensive though, so most tubes do not have them. These soft x-rays are useless for typical radiography purposes anyway so there is no need to keep them. The intense heat that the electron beam produces can melt most everything, so tube anodes are typically made of tungsten embedded in copper. This copper protrudes from the tube so heat can dissipated. Coolidge tubes often come with an “anode heat storage capacity” chart on their datasheets, but for the most part the heat storage capacity is 7kJ for a dental x-ray machine tube. If you exceed this rating you can expect the tungsten to melt, but normal operation also causes some pitting and cracking on the anode, the likes of which can be seen in this image. Aside from having a high melting point, the tungsten anode also gives the tube another advantage. There is a second mode of producing x-rays, something called characteristic production. In this mode, electrons hit other electrons in the atoms’ lower shells and knock them out. These holes are then promptly filled by electrons from higher shells who emit x-rays on the way down. Tungsten K-shell electrons have a binding energy of 69.5keV so to kick these out your impacting electrons must have energies greater than 69.5keV. Typically you’ll need to give the anode 72kV or more to accomplish this, hence the standard 75kV x-ray tube. After you succeed in kicking out a K-shell electron, the hole will immediately be filled by an electron from the L-shell, binding energy 10.2 keV. The difference between these energy states; 69.5 keV and 10.2 keV gives us characteristic tungsten x-ray energy of 59.3 keV. Once 72kV is applied to a tungsten anode Coolidge tube x-ray production at that energy spikes, as seen by this chart here. This is the full spectrum of a 75kV tungsten target x-ray tube. Anode voltage controls the hardness of the x-rays produced but current controls the intensity of the x-rays. Tube current can be controlled by adjusting the temperature of the heater, something itself controlled by the voltage applied on the heater. More volts = more heat = more current = more x-rays. Typically tubes from dental x-ray machines are designed to be run at 7mA, though this varies. If you can find the tube’s datasheet there is usually a voltage vs anode current chart on there somewhere. Don’t forget that more current also means more heat and too much heat will melt the anode. In certain Coolidge tubes there is actually a third electrode in front of the heater and much like a triode, different voltages applied to this grid will allow different amounts of current through. However for hobbyist purposes this grid can be left unconnected and the tube can be controlled via heater voltage, which is much easier to adjust in my opinion. Dental Coolidge tubes are designed to be operated under oil and while they do work in air you still should use them under oil. Oil is a better heat conductor than air and it will allow the tube to handle more power than it could in air. Tubes should also be operated under oil to prevent the high voltage from just “flashing over” the tube rather than going through it. When the tube flashes over the high power sparks may crack it, and that’s no fun. In order to prevent flashover always make sure the tube’s cathode is fully heated before applying high voltage. 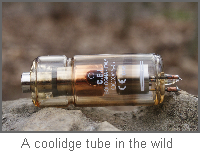 Most Coolidge tubes are designed to be surrounded by a jacket of lead containing material. The tube jacket blocks off-axis radiation and makes an overall better quality x-ray beam. Tube jackets aren’t hard to make, just some lead sheet and a solder. Certain tubes don’t require a lead jacket as they have anodes designed to specifically block off-axis radiation (right), though I still recommend jacketing them. Thanks for you great science website. I have just been looking at a C.E.I. X Ray Tube OX/70-g4 for $105.00 on E Bay. I have a small HV 25kV power supply from United Nuclear, some lead shielding, etc. I have been running a Crookes tube with fair production of x rays measured by geiger counter. I am ready to try a real x ray tube (with precautions, of course). This tube on E Bay has 3 wires (red, black and blue). I could use some advice on how to make the electrical connections, attachments etc as well as how to immerse this thing in mineral oil. Can you help? That’s effectively all there is: just connect up the tube, and immerse it in oil! Be sure to not break the glass seals however, as they are very fragile. The Devil’s in the details. 1. How do I determine which wire goes where? As you know, there are multiple color-coding systems for wires. I don’t want to accidentally blow out the filament. 2. How much oil? If I just sink the thing into a resevoir of mineral oil, won’t that significantly attenuate the x ray beam. After all, I need to be able to focus on a target. How did you do it? also, enough oil to cover the tube should work. when dental tubes are placed in an actual tube head, they are completely immersed in it. Other than that, trial and error always works, just make sure the tube doesn’t overheat.